We stayed in this apartment over New Years and had a great experience. Bus for lifts picks you up a short walk in either direction. They had fruit when we arrived and a ski room on the first floor for our skis. Easy walk from the train and our favorite spot to eat was Grizzly pub! Fantastic apartment with Matterhorn view! This apartment exceeded my expectations. It was ideal for my family of 4. 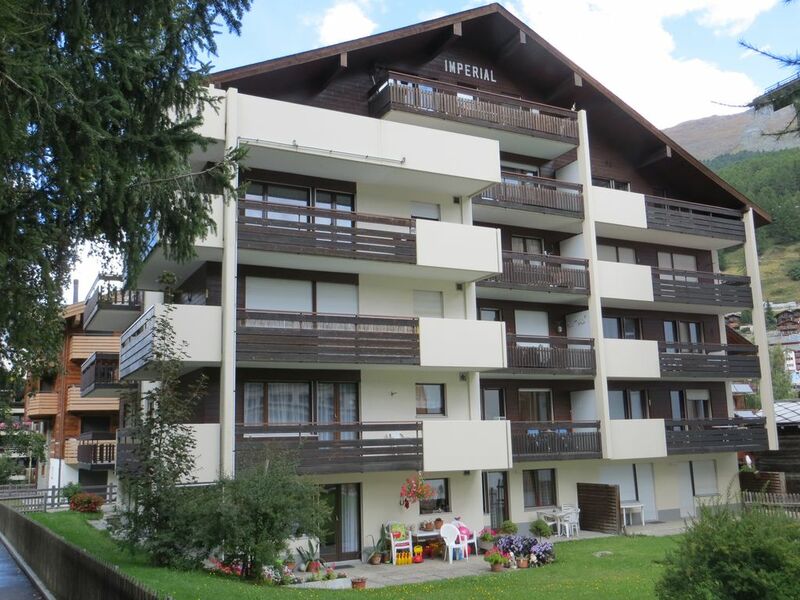 Centrally located in Zermatt, only a few minutes walk from the train stations and shops. It was very well kitted out and perfect for our holiday. Communication with the owner was very prompt and comprehensive, with all the information given that we needed. My only (very minor complaint) was that we would have liked more pillows on the beds, but apart from that I cannot fault it. We will definitely stay here again. The apartment was as pictured & described. It has easy access to groceries, restaurants, the train station & hiking trails. Communication with the owner was very good. We would recommend this apartment to other travellers visiting Zermatt. Perfect apartment and location for two couples. A short walk to the train, Gornergrat station, and groceries, the apartment is so easy in hilly Zermatt to access and use as a base. A great value, both bedrooms are doubles (not bunks) and though one bath, it is well laid out to share. The kitchen is well equipped and is OK for two cooks at a time. The living room is spacious, comfortable, and has large windows to the balcony and Matterhorn...no guessing the weather. One bedroom shares the view. The view is enhanced by the location on the fourth floor. The only limitation is the laundry...good news is that there is a washer / dryer in the basement...less good news is that the dryer is not powerful...plan on doing laundry on the first nights and hanging to finish drying for a day in the apartment. We loved our four night stay. Thank you. Amazing location. Clean, comfortable and spacious apartment. If we come back we will stay here again. I do wish there was a set of measuring cups and spoons in the kitchen, but that is a very minor issue. Lovely apartment, spacious and well appointed. Lovely housekeeper and owner at hand with any issues. Zermatt is a car-free resort. It can only be accessed by means of public transport or taxi - minibus. In the resort: electric taxis (see photo). By train: this is the easiest way to access the resort. Zermatt Train Station is 300 meters from the building. From Zurich or Geneva, it takes about 3:40. By car, take the motorway: Follow the A9 / E62 to Sierre, then N9/E62 and follow the signs to Zermatt before entering Visp. Leave the car in Täsch (garages) and take the shuttle train to Zermatt Täsch. You can also charter a minibus in Täsch. Within Zermatt, you will walk, or hire an electric taxi for long distances or if you have luggage; Electric shuttle bus provde a regular service for accessing cable-cars - but the two closest departure stations are 250 and 350 m away, respectively. The shuttles are free for ski pass holders. An access map to the building will be provided with the rental agreement. Numerous summer and winter activities are described on the site: http://wwww.zermatt.ch . Hundreds of kilometers of hiking, of every difficulty level, are open in the summer, many routes are available for mountain biking. One can practice paragliding in good weather, summer and winter. Two rinks, one of which turns into tennis courts in summer, allow recreational skating or ice hockey. Several indoor pools are open all year. Zermatt is renowned for its gastronomy. Many restaurants offer cuisine from the Valais (Whymperstube, Zermatterstübli, Café du Pont), grills (Stockhorn Restaurant, Café Gypsy, etc..) Japanese food (Fuji of Zermatt, Myoko), Italian (Al Bosco, Alexandre )or Chinese cuisine (China Garden), and you'll discover amazing mountain restaurants (Zum See, Fluhalp among Vroni to Findelen ...). List and phones (it is often necessary to book) at the Office of Tourism. An updated list is available in the apartment. Shopping: one finds everything in Zermatt with the exception of major fashion brands! Bahnhofstrasse stands out for a row of shops where the finest watches and jewelery available to Europe attract the would-be buyer. Sports stores offer equipment and clothing, and advise you with kindness and competence - in your language. There are opportunities to suit all pockets, however, and you can bring an original souvenir without breaking the bank. Despite its deep and Valais mountain character, Zermatt holds an international environment; tourists from around the world are everywhere almost all year round, and the welcome is multilingual.